In our Facebook Group, the question comes up a lot about the best way to bring shine and a nice glossy finish back to the dried paintings. Acrylic paints can dry rather dull and darker than when wet, but adding back a glossy finish and brightening up those colors again is easy! An older form of finish that contains alkyd resin, oil, and solvents. Glossy finish that self-levels and smooths out like a resin. Glossy finish that won't amber over time. Cleaning. A protective top coat on your paints can keep off dust and other dirt or marks that could build up over time and discolor the painting. It would also protect it from splashes and create a water-resistant finish. That doesn’t mean you should rinse off your painting under the tap if it’s dusty, but a wipe with a lightly damp rag shouldn’t do any harm. Colors and shine. Acrylic paints can dry rather matte and dull and often look a bit disappointing when compared to how they shine when they are wet. By adding a glossy coat on top of the dry painting, you can really make those colors shine again, and it helps to brighten them up – like a wet-look again. Smooth finish. If your painting dries with a few pinholes or more texture in the paint than you would like, you can usually smooth out the surface by using a self-leveling protective finish. The more layers you add, the less any unwanted little bumps or textures will be noticeable. What is the difference between a protective finish and a varnish? 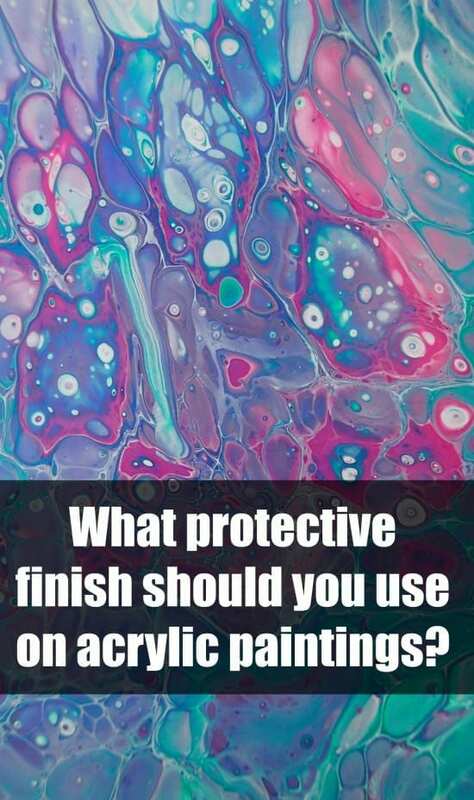 You may have heard varnish used as a generic term for any finish, but traditional varnish describes an older form of finish that contains alkyd resin, oil, and solvents. When applied to surfaces indoors or out, varnish cures into a thin and glossy film with a faint yellow or amber tint, similar to the finish achieved with oil-based polyurethane. So although we might talk about ‘varnishing’ our paintings to protect them, we aren’t actually using a real varnish to do that. A varnish would be oil based and typically has a slightly yellow tint – not good for our paintings! A typical varnishing session with Polycrylic. What makes a good protective finish for your art? The Polycrylic protective finish checks all the boxes for me when it comes to protecting my artworks. It’s easy to use, you can really put it on nice and thick and there are never any brush strokes. It self-levels so it spreads and smooths out a little like a resin. It’s glossy, and it’s not too expensive. I can easily wash out my brush after and it never hardens. That was interesting advice about allowing the acrylic paint to fully cure before applying the top coat and I think that would be good advice to follow whatever top coat you decide to use. I usually leave it about 10 days and so far (fingers crossed) I’ve never had any issues with this finish. For fine art and archival purposes a solvent based sealer is best, this is because it can be removed if need arises to repair a painting in the future. Acrylic based varnishes/sealers can not be removed. That’s a very good point that serious artists creating awesome art works should consider. Which one do you recommend Jacqi? I use Gamblin products on my fine art acrylics. The product is known as Gamvar and the solvent is Gamsol. Gamvar comes in matte, satin or gloss. I recommend painting an isolation layer on your piece first. This solution is 2 parts Golden Gel Medium to 1 part water. Paint an even thin coat that goes on milky but dries clear. Let this gas out and the paint the Gamvar on in a single thin even coat. I prefer the satin but have used them all. I use the same method as Dan. Before applying any varnish I coat the fully dry acrylic canvas with an ISOLATING coat. The same as Dan uses. Then the varnish. I use Soluvar by Liquitex. If the painting in the future needs to be cleaned the varnish can be remove to the isolating coat, without harming the acrylic. Thankyou for sharing your knowledge, it is fantastic to know what and how to use paints and Varnishes. I was going to do a record but didn’t quite know how to paint the Gesso onto it should I do it in the round groves of the album? Thanks Lee from down under. I’ve been trying to find the answer to a query I’ve had in regards to using silicone (or any oil-based product) in the paint to create cells. We all know oil and water don’t mix… nor does oil evaporate. Do the silicone additives leave residue on the dried paintings? Is there any reaction when you do clear-coat the finished results? Yes you do get silicone oil sitting on the surface of the painting when it is dry. I remove mine by rubbing in circular motions with some talc or cornstarch, then brushing that off with a soft towel and wiping down with a wet wipe. If there is any oil still visible repeat these steps and its all good to go and varnish. Never had any issues with it separating. Thanks for asking. Fantastic! Thank you for that info, Deby. There’s information everywhere about silicone but not a lot about removing it from the finished product. I finally found a tutorial last night (I think by Danny Clark?) which gave a few methods of removal. Whatever is on sale in the store. Just the cheap ones, nothing super fancy with added lotion etc. Did you figure out a way to finish the small tiles to make coasters? I used a triple coat product but after several weeks it got tiny bubbles in it. Oh Lord I am so impatient. Thanks for this Deby. Now to see if I can purchase here in Australia. I’m getting ready to topcoat my first pour and decided to use Polycrylic as you recommended. What brush do you use? I hate to use a good art brush. Have you tried the Wooster Shortcut? I use a really soft varnish brush I got from my DIY store. I only use it for varnishing and make sure to wash it in soapy water afterwards. Thank you for sharing all of your great experience and ideas! I just finished top coating my pours with Minwax Polycrylic Gloss. I have an unexpected result. It crackled the finish of all the paintings, especially in the areas of thicker paint. Do you have any thoughts or suggestions? Oh that is terrible. I’ve not had that on any of mine. How long had you left the paintings before varnishing, and what surface was it? The pours were comprised of medium flow acrylics, PVA , Floetrol and treadmill silicone on canvas. Sizes 12×12, 16×20, 11×14. Let dry between 3 weeks to 1 week. I top coated 15 pieces, all did the same thing to varying degrees. Two coats of Polycryl Gloss. Could it be the amount of polycryl? I thought it applied rather thick. I applied it with a good quality synthetic brush, but was getting brush marks anyway. I have refinished furniture, so top coating is not unfamiliar to me, though, I have never used Polycryl before. Can polycryl be thinned a bit with water or Floetrol? I have also had crackling with polycrylic. I think it was because I poured it onto the canvas and perhaps didn’t allow enough time for the canvas to “cure” first. Since that happened, I take precaution not to pour on the polycrylic nor to apply too soon and I’ve had great results. I notice Deby applies 3 coats and I’ve only applied 2, so I think I’ll try 3 coats because I love how glossy her work looks. I tried pouring the polycrylic and it ambered horribly…had to throw out the painting ?. I still use it, but I float it on w/a foam brush…. I only use Liquitex Pouring medium with soft body and fluid acrylics. I was excited to hear about the polycrylic drying smoothcwithout brush strokes but now concerned because Carol said she had cracking. Carol what paint, mediums, do you use water or silicone? How long did you let your paintings cure? Even if you put varnish on your painting (after isolation coat first); if you put it before the painting has cured well the varnish will streak across with the acrylic. So make sure your paintings are cured well especially if they are thick acrylic. I found a cheap clear spray varnish will that work? The only way to find out is test it and see 🙂 I suggest testing on an old canvas you aren’t so in love with and see how it performs. Sprays usually are best used in several very light coats. They don’t have the gloss of a thicker brush on varnish but will still protect your paintings. Thanks for your info. One question-what happens when silicone oil keeps rising to the surface of a painting? will it affect the sealer and the paint? I’m finding that I get brush strokes even with a fine varnish brush. I recently bought the Mod Podge brush to see if that will leave a smoother finish. Any suggestions on application? Thank you. It might be that you are using it a bit too thinly. I really slosh it on there nice and wet and then the brush strokes even out and smooth away behind the brush. The only time I’ve had trouble was when it was really hot here and I put it on too thinly and it was basically drying as I was doing it. Thank you for that tip. I decided to put a thicker layer on and it dried in a cracked pattern. How many coats do you usually apply? I usually add 3 or 4 coats and leave 24 hours between each one. I did a thicker coat on six pieces hoping for a self leveling effect and no brush marks and all of them cracked. I am so frustrated. Oh that is frustrating. We’ve had a couple of people post examples of this in the FB group recently too. It seems to happen very rarely and since it just started now, I’m wondering if humidity or temperature, drying time etc has anything to do with it. You may be able to hide the cracks by applying more layers. The application was in the San Diego area with higher humidity. I have had success applying it here in Phoenix, AZ. I love the Mod Podge brush to apply it with. I use a foam brush and float it on quite thickly…keep your torch handy for bubbles. I have a beautiful large acrylic painting (bought 10 years ago) of an ocean wave. The painting is covered in a varnish / resin lacquer. I can see its the lacquer going yellow not the painting underneath the lacquer. So my beautiful white water wave is going ‘yellow’. From what I’ve read here it looks like my painting is unrepairable? There is no way of getting the lacquer off? Any comments or ideas to save my painting? That is disappointing. I’d suggest taking it to an expert just for a review. They may be able to test a little of the varnish on the side of the painting and see if it is easily removable with a solvent, without damaging the paint underneath. I think varnished acrylic paintings are going to be a challenge for conservators in future. I am from Australia and am finding it difficult to source Minwax polycrylic. What can I use instead? Not being from Australia, I’m finding that hard to answer. I know you have some really good art stores, so I suggest getting one of the artist varnishes designed for use with acrylics. The staff there should be able to help you find the perfect one. But for DIY store alternatives, I really don’t know what you have available. You used a polyurethane? Hmm, I’m not sure if that is the best finish for acrylic paintings. Have you used it before successfully? If the first coat has cracked, it really is almost impossible to repair that. You can add more coats and it may smooth out and hide the cracks a little but I don’t think they will disappear. 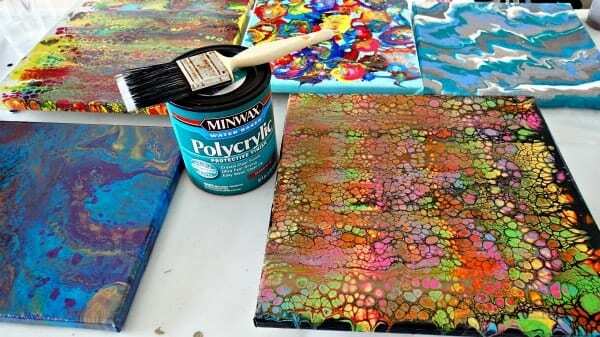 Did you use PVA in your painting? It seems to be the most common indicator when the varnish crazes or cracks. Hello. Very interesting comments. Thanks for all the information. My question is what do you think k about pouring on Old celling fan blades? I was going to buy new but what the heck stretch out the life of them with a pour of acrylic and varnish them. What do you think about this idea? Thanks Carol H.
If you have any advice I’d appreciate it. Like better paint. Or silicon or not. Like I said, any advice. Thanks. Somehow my last name got auto correct lol. Its not Hey Ginger. Omg, it’s Hettinger! I think so long as they are well cleaned and then well sealed it should be fine. It would look really cool to see them spinning with all the colored paints on them. If you try it, I hope you will come to our chat group and share some photos. Is there any recommendation on a sealer to use with an acrylic pour on glass or plastic? Or tips, or a link that I should check out? Thank you! I’m new to this but it is quickly becoming my new love. I’ve used the Polycrylic on both glossy tiles (which are a bit like glass) and on pours on vinyl records and been very happy with the results. But it’s may favorite and I use it on almost everything. I don’t have a lot of experience with other varnishes to compare to. Here is more info about the Poly. coloring. Could this just be Irish luck? These pieces are about one year old and take strong tropical sun in the morning. I had to learn how to handle the resin as it can be tricky. But now I do just one coat and I am pleased with my results. We are hot and humid 24/7 and breezy! What I have learned over the years of living in microcosms and crafting and painting murals and now this is…you CAN get anything you want from anywhere in the world IF you are willing to pay the price. For me, as an example…if you can buy something for USD $1, that dollar item will cost me USD $5. So I pick and choose my purchases VERY carefully. I love all the advice from all of you. I would never have gotten as far as I have without your assistance . Thanks for your generosity of spirit and always good “tips”! I watch your videos and am in awe of what you do. I’m still new to pouring, and used the Polycrylic in the matte finish (customer requested the finish) on a piece and it turned out more of a satin finish. I stirred the can very well, and removed the raised silicone before adding the Polycrylic. Any thoughts on why I’m not getting the matte finish? Interesting. I’ve never used the matte so I can’t describe what the finish on it might look like. Maybe snap a couple of photos and send off to Minwax and ask their advice. I’ve always found them to be very helpful. Hi! My experience with various finishes keeps me away from matte because it sometimes has a mild sheen. Perhaps you could purchase the same product in flat and paint over your matte? I have seen different results for the same finish from different companies. Just a thought!! Hope you figure it out but before doing the piece again, test it. Good luck.